As a business owner, property manager, or anyone tasked with managing the beauty and efficiency of a structure’s elevators, you are likely in search of cost-effective solutions that provide complete quality and peace of mind every step of the way. All across the nation, businesses have benefited from the comprehensive approach to quality taken by Kohtler Elevators. Our team specializes in providing amazing support to match our quality elevator parts, including interiors, entryways, and more. We understand the value of providing a full-service approach, and our sales staff is ready to help your building benefit from amazing industry solutions. Commercial elevators are complex systems, relying on highly machined components all working in tandem with weather-proofing elements, shearing equipment, and computing components to deliver high-speed operations that are both safe and reliable. Today, we’ll highlight a few areas where our team can upgrade the beauty and reliability of your current system. Our elevator company takes a precise approach to every step in our design process, and our elevator doors are no different. Each door is comprised of high-quality steel and inspected for optimal performance. Our products are versatile, durable, and are rated for 90 minutes of fire resistance.by Underwriter Laboratories (UL label). Kohtler Elevators can also provide the style choices to better match your lobby and interior elements. If you live near the beach, we have elevator doors that fit your needs. Contact us today to learn about our elevator door finishes, including laminates, decorative metal, powder coatings, and more! Appearances can do much to benefit your business, and backing those aesthetics up with high-quality elevator entrances that perform well after heavy daily use can further benefit your investment. Kohtler’s entrances comply with ANSI standards and safety codes, inspected to ensure the highest quality for a user across a wide range of industries and are rated for 90 minutes of fire resistance by Underwriter Laboratories (UL Label). Our team can provide highly personalized results that match your company’s style while complying with all concerning regulations. From two-speed entrances to single slide or center-opening devices, or any other combination of openings, Kohtler Elevators will help you to find a perfect match for your new or existing doors. Our comprehensive approach, backed by our quality elevator parts, ensures that you are satisfied with the results. Durable – We understand the wear and tear placed on many systems, and work to ensure that your elevator cab’s interior is built to last. Quality construction helps to increase the longevity of your elevator’s aesthetics as well. Versatile – Our elevator cabs are built to be scalable for a range of budgets and demands. Regardless of your industry regulations, our elevator company is here to build compliant outcomes! Beautiful – Interior upgrades can provide a wide range of benefits for your business. 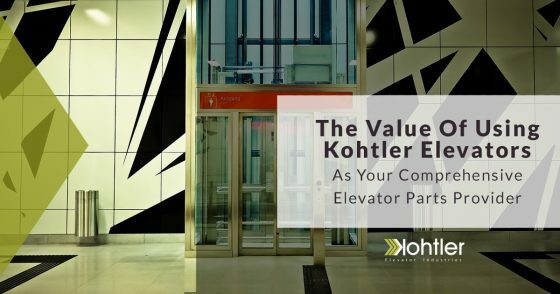 From hospitals to apartments, Kohtler Elevators can provide the perfect look for any enterprise. Regardless of your company’s specific demands, our elevator manufacturers are happy to provide personalized results. Every aspect of your elevator cab — from the handrails used to the ceilings, cab fronts, panels, buttons, lighting, and more — can be modified to meet your needs. Design experts, building contractors, and property managers can all benefit from the personalized approach we take for every project. You’re guaranteed to find an ideal outcome with our nearly endless array of aesthetic features. Kohtler Elevators is here to provide long-lasting results that meet your project demands and budget. Be sure to contact us today to learn about our array of elevator parts, and be sure schedule your consultation!